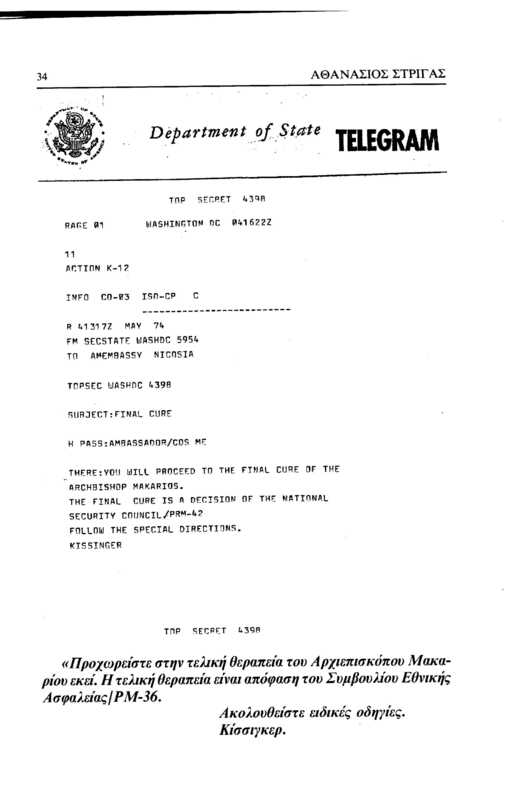 Home > Background Information > Dean Acheson & George Ball 1964 – Smoking Gun? The principal subject for discussion at the President’s luncheon today was Cyprus. Those present with the President were: Secretary Rusk, Secretary McNamara, Under Secretary Ball, Mr. Dean Acheson, and myself. Acheson and Ball revealed their agreement on the conviction that the only solution now would be a fait accompli in which the Turks would move to occupy the Karpas peninsula, triggering an instant enosis under Greek leadership, with a consequent supercession of Makarios. Acheson in particular emphasized that no negotiated solution was possible because of the weakness of Papandreou and the strength and intractability of Makarios. On the other hand, a program of indefinite delay could only strengthen the hand of Makarios and increase the danger that an eventual Turkish explosion would be both violent and undirected. A number of questions were raised by the President. What would happen to the Turks on the island? Mr. Ball answered that he would expect most of them to stay and that, with luck, bloodshed would be limited. The President asked whether the Greeks would follow this scenario and whether they could control the Greek Cypriots. Ball and Acheson pointed out that there already exists between Athens and Nicosia agreement to move to instant enosis if the Turks move against the island. They expected that this agreement would probably be carried out. 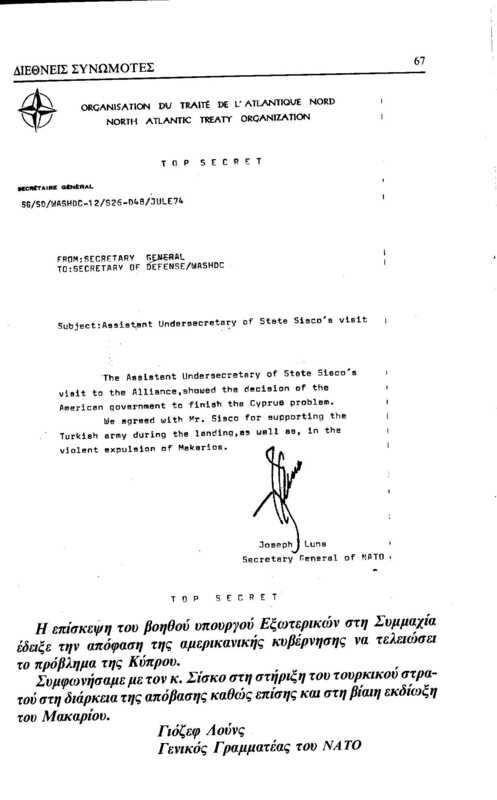 The Secretary of State asked whether Makarios would appeal to Moscow instead of to Athens. Mr. Ball thought he would not, and he said the appeal would not be answered in any serious way. I asked what would trigger the Turkish action, and Acheson answered that nearly anything would serve. The most immediate possibility was the refusal of troop rotation. The President summarized by saying that Mr. Acheson’s argument appeared to be that we must expect a resort to action in one way or another, and that the choice was whether it should be messy and destructive or controlled and eventually productive, in accordance with a plan. Mr. Acheson agreed with this definition of the problem. He indicated that in his discussions with a Turkish military leader the Turks had shown that there was a great Turkish interest in such a plan and that the Turks would do their best to execute it with a minimum use of American weapons and a minimum resort to those kinds of force—like air bombing—which were internationally unpopular. 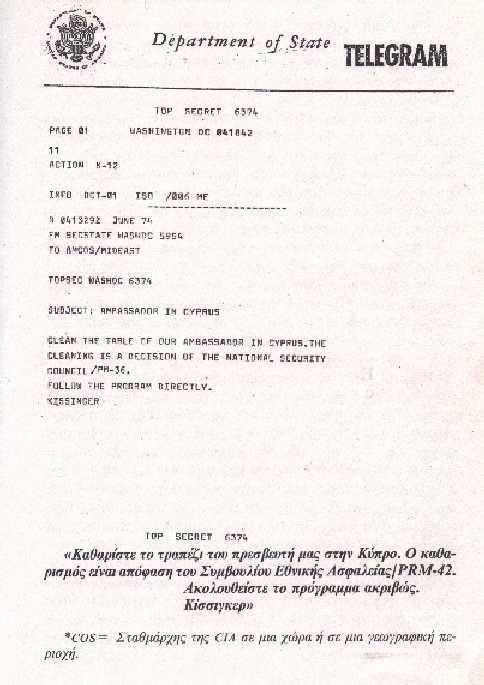 Mr. Ball pointed out that it would be impossible to warn the Greeks of any planned Turkish action because of the danger of leaks to Nicosia. He also noted that the British would be troubled about this plan because of the status of Cyprus as a Commonwealth state. Mr. Acheson remarked that this might be true for Butler, but that Mountbatten would be friendly and that the British bases would be protected under this plan. The President indicated his own doubt that the plan as put forward could in fact be neatly and tightly controlled, without risk of escalation. He thought that in particular the Greeks would be very likely to move with all their strength on the island against a Turkish lodgment, and he asked McNamara for a careful Joint Staff study of the problem. The President also noted that the next two months were not a good season for another war, and the question was raised whether it was essential to press along this road before November. No definite answer was given, and it was agreed that Mr. Ball would prepare a more detailed staff study of the entire plan, to include both its military and political elements. American Government to finish the cyprus problem. Click orange link and then the four arrows in top right to expand the document.